Show your support for friends and family members who are struggling with autism by wearing this beautiful hand stamped necklace. It's a unique and beautifully designed autism awareness piece that will show your passion for this important cause in a subtle way. 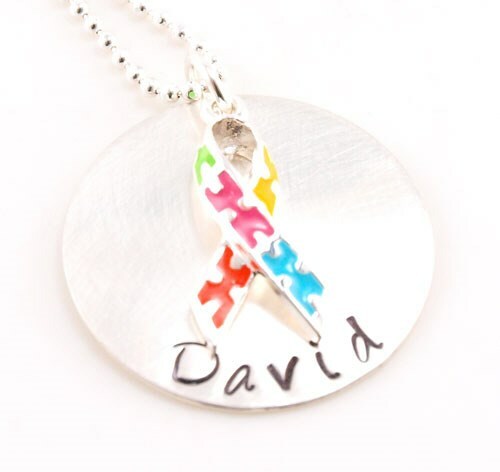 This Autism Awareness Ribbon Necklace features a 1” sterling silver disc and a sterling silver enameled puzzle charm. The round disc may be hand stamped with any name. Both disc and ribbon charm hangs gracefully from your choice of a 16”, 18” or 20” sterling silver ball chain necklace. Free personalization of any name is included. Today’s Price: $55.99 In Stock! Choose Necklace Lenght: -Select- 16" 18" 20"
Additional Info Find a variety of autism awareness products right here at MyWalkGear.com! This hand stamped autism ribbon necklace will be a great accessory for those who want to show how important autism awareness is to them in a subtle way. Our Awareness Ribbon Hand Stamped Necklace is another popular jewelry piece.